Cape Town - The Stormers face a testing end to their Australasian tour with Eben Etzebeth and Pieter-Steph du Toit on their way back to South Africa, but there is good news for the Springboks. It means that the Capetonians go into Friday morning's clash against the Reds in Brisbane without their two biggest weapons in their pack. Du Toit has returned home to be there for the birth of his child, while Etzebeth has been ruled out for the next two weeks because of a calf strain. While Du Toit's time off will be most welcomed by Springbok coach Rassie Erasmus with this being a World Cup year, Etzebeth's run-in with injuries lately is not good news. A head knock against the Jaguares at Newlands back on March 15 saw him ruled out of the following weekend's clash against the Hurricanes in Wellington. While he was monstrous in the Stormers' 24-9 loss to the Blues, that performance clearly took its toll on the 27-year-old. "We will only know the extent of the injury when he gets back, but it's not too serious," was the encouraging news to come from Stormers assistant coach Dawie Snyman on Monday. "It's a bit of a calf and he's had a calf history. "It's a big year for him and we just need him to be 100% for us too. You saw what he did when he was on the field. "We're confident that he will be ready as soon as possible and that he will be ready to contribute to the Stormers and to the Springboks later in the year." The other man in desperate need of a rest with the World Cup in mind is Springbok captain Siya Kolisi, who has started every game this Super Rugby season. That break seems unlikely with Etzebeth and Du Toit both sidelined, however. "Siya said immediately after the (Blues) game that he wanted to play because he knew we were losing some experience," said Snyman. "As a captain, he wants to play and make sure he keeps the team together. "We'll look at where we have an opportunity to give Siya a break." Dan du Plessis, meanwhile, is also returning to South Africa with a knee injury while tighthead prop Wilco Louw is a doubt for this weekend. 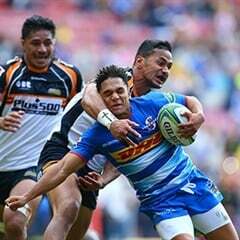 "He got a shot on his ankle," Snyman said of Louw. "We were a bit worried initially after the match, but on Sunday he was much better. He went for scans and we aren't sure about this weekend, but it's one week maximum." Friday's clash in Brisbane kicks off at 11:00 while the Stormers' final match of their Australasian tour is against the Rebels in Melbourne next Saturday.